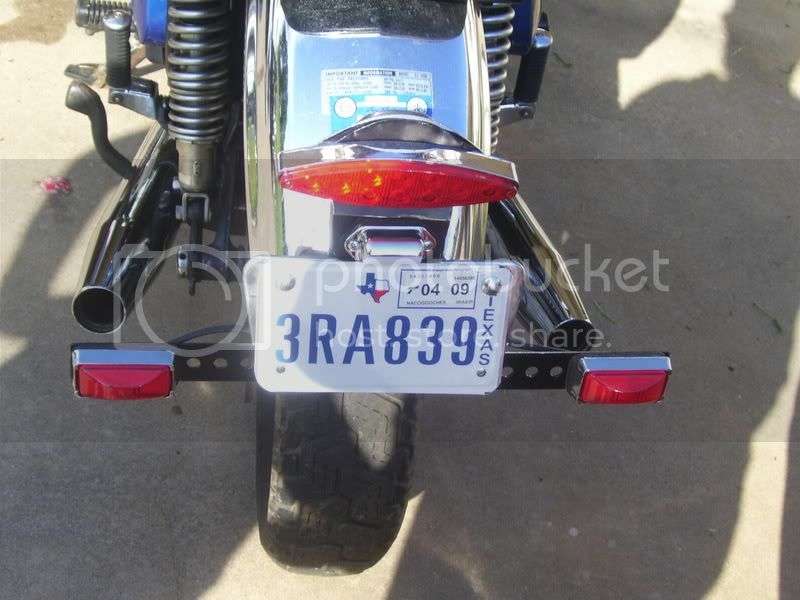 Mounting Small Front Blinkers - NGWClub®, Inc. I've trashed the Winjammer (literally, it got hauled Monday). I had responded to a thread by Bill "HeartAttackBill" Bye asking for a Vetter headlight. About that same day I had made a thread looking for a stock headlight. We worked a trade ... he got all the stuff from the fairing (headlight, signals, wiring harness) and I got his stock-ish headlight and some tiny turn signals. That worked out great, an even swap, each of us paying shipping only, and a few days later I had my stuff and Bill had his. Now, how to attach these signals to my stock headlight ears which the P.O. had left on the bike? I searched the web and bike shops with no luck. So, being a resourceful kinda guy (I save all manner of stuff: parts, brackets, wires, you know...) it was off to Home Depot for some recon. Looking for a "farmer fix" can sometimes take a bit of time and ponderin'. After about an hour I was back in the electrical aisle and found an "old work" box that had two corners without any knockouts. I now had a plan! I picked up two of them (you know, 1st the prototype, then the finished product) and headed back to the shop (well, the basement anyway). I marked up one of the boxes. 1-3/4" x 1" x 1". Then I went at it with my trusty hacksaw. Soon I had the necessary pieces for my little blue boxes. The top, front and outside end are from the corner of the original box. The rear facing side was cut from the scrap. I tacked the pieces together with dots of super-glue. To make them a bit stronger at the set-screw connection, I found a metal bracket in my vast junk collection and cut it to fit on the boxes' inside-top. A liberal dose of epoxy and 24-hours later my 4-1/2 sided boxes were ready for finishing work. The boxes were shaped with 150 grit sandpaper and then finished with 600, 1500 and crocus cloth. A 1/8" hole was drilled for the set-screw that attaches them to the tabs on the headlight ears. And a 1/4" hole was made on the ends for mounting the lights. A couple of closeup views. And here's the (almost) finished product. A prototype good enough for done and I got $1.12 back on the box I didn't use. I kinda like the blue but will probably go gloss black. Looks like I need to polish the headlight ears. Hopefully they can stay chrome but those may get painted black also. That wouldn't look too bad since the new headlight is black (not chrome like stock). Here's the final painted and mounted set of front blinkers. Last edited by Roady on Sun Nov 23, 2008 3:10 pm, edited 2 times in total. Nice job look like the lights on my 76 bobber. The threads on mine screwed right into the side of head light where the reflectors go. I don't get the pun, but I'm happy that you intended it. Stuff like this is fun for me. I don't do crosswords or jigsaws or play computer games. But, this is the kind of puzzle I enjoy. I made some from trailer side marker lights. After removing my vetter, I had none, so I improvised. Cheap but effective. Thanks for the ideas guys. I have been trying to figure something out for my '77 throughout all of last winter. I got the blinkers mounted on the bike and finally got out for a real ride. This was the first ride since the carb rebuild. Also, got the front and rear brakes sorted out (thanks for the Tech Tips, Randakk!) so she stops and they don't bind up. That teeny-weenie hole down there got cleared out with one strand from some speaker wire. So, I bought her on 7/7/07 and just came in under the one year wire. And wOooOOOOooOOOOoooooOHHhhooooooooooooo! was it worth it. One year, a fine goal! Texson wrote: I made some from trailer side marker lights. After removing my vetter, I had none, so I improvised. Cheap but effective. Sorry to resurrect an old post, but...I like what this guy did with his front marker lights. Looks easy. Unfortunately, he hasn't logged on since Nov 2010 so I can't ask what he did. 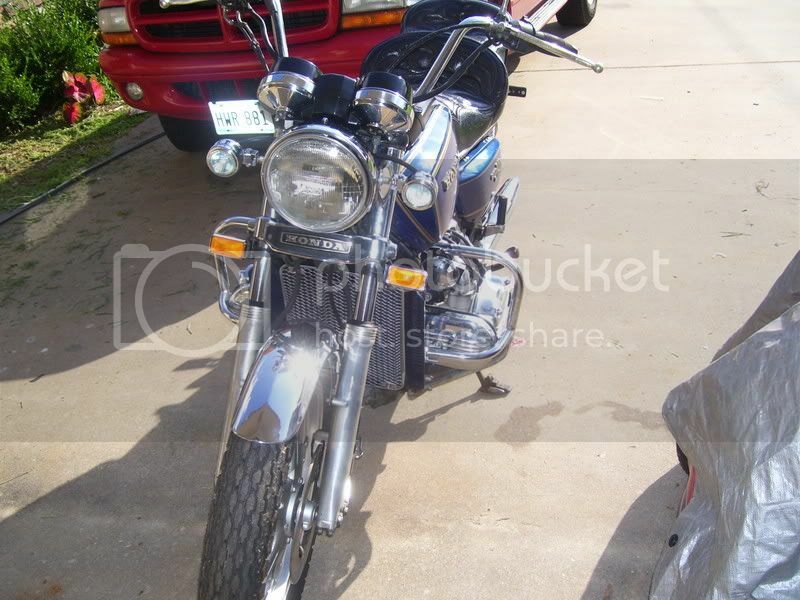 Does anyone recognize what he used to mount his turn signals to the forks? My mounting ears were cut off by the PO and this install looks clean. Looks like they might be clamps of some kind?? I would worry about them bottoming out??? Yeah, I saw that part. I was hoping I could relocate them to just about the old mounting spot. That way they would not get crunched. If the threaded holes are still there somewhere on here I read a post about using a pipe thread fitting to screw in there to use as a attachment point.